This suspension lift is designed to give your Jeep TJ optimal on and off-road performance with up to a 32 tire. It offers a perfect balance for a daily driver that also desires great off-road performance. These ride quality and performance gains are delivered by Rough Country's new progressive rate coil springs combined with their Performance 2.2 shocks. 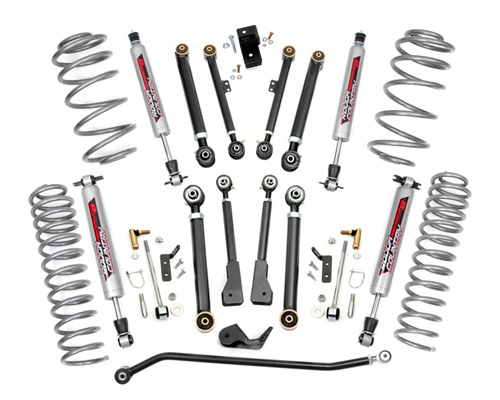 Front: Lifted coil springs, upper adjustable control arms, lower adjustable control arms, sway-bar quick disconnects, adjustable track bar, hardware. Rear: Lifted coil springs, upper adjustable control arms, lower adjustable control arms, track bar drop bracket, hardware. See instructions for complete tire/wheel information.